Home / News / New to IHA – Africa Ozone! 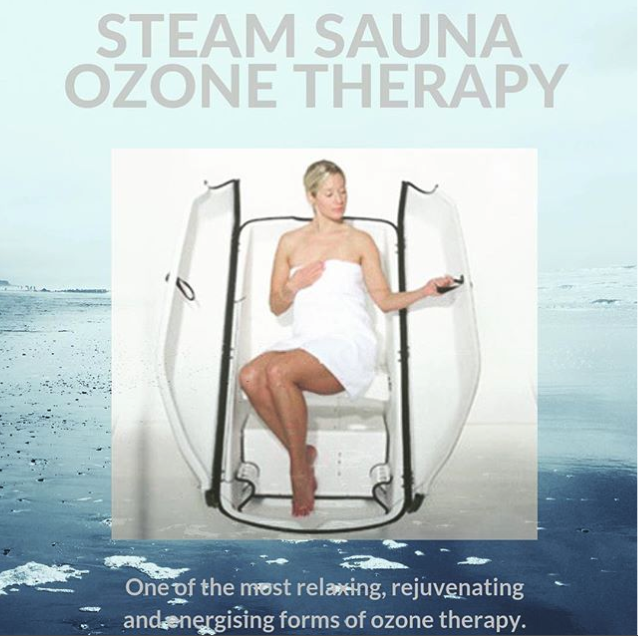 Steam Sauna Ozone therapy is a 20-minute treatment, during which you are seated in a steam sauna “pod” with your head outside of the unit, whilst medical ozone is circulated through the pod. Medical ozone is made by passing oxygen through an ozone generator, giving the oxygen three atoms, (O2 becomes O3). The cleansing properties of medical ozone make it effective in destroying viruses, bacteria, fungi, plaque and cancer cells. Ozone is infused through the steam and warm air into your skin. As it reacts with the water on your skin it breaks into oxygen and a single oxidising atom is absorbed into your blood, lymph and fat. It works to detoxify your lymphatic system, helps clear your skin, relaxes your muscles and accelerates blood flow. You will have an enjoyable sauna experience while treating your body with a high level of oxygen and ozone! The majority of our toxins are held in our lymph and fat making this therapy an effective way to help eliminate them. Since our skin is our largest organ of elimination, the majority of toxins are sweated out and blood flow is improved to eradicate the toxins from your system in the hours after your treatment. The Krebs cycle is the sequence of reactions by which most living cells generate energy during the process of aerobic respiration. It takes place in the mitochondria, using up oxygen and producing carbon dioxide and water as waste products, and ADP is converted to energy-rich ATP. Ozone activates the Krebs cycle and causes an increase in the red blood cell glycolysis rate which leads to an increase in the amount of oxygen released to the tissues. If used regularly, steam sauna ozone therapy will reduce recovery time between races and improve your recovery time. Your body fat is a combination of carbon, hydrogen and oxygen molecules. When you add oxygen to body fat, it should break down into hydrogen and oxygen molecules, which is urinated out of your body, or carbon and oxygen molecules which leave your body through sweat. Toxins are removed from your body, so your body no longer needs extra fat to store them. Ozone Therapy helps burn fat and gets your metabolic rate back to where it should be.